Crystal S. Roman is the multi-talented Black Latina artist who runs one of the most successful companies championing Afrolatin@ stories, the Black Latina Movement. The Black Latina Movement boldly shares Black Latina experiences through theater, music and film. They live up to their mission by not just putting Black Latinas on stage, but portraying them in a positive light. We caught up with Roman and got the details on her series Colors of Love, her writing process and her advice for artists of color. 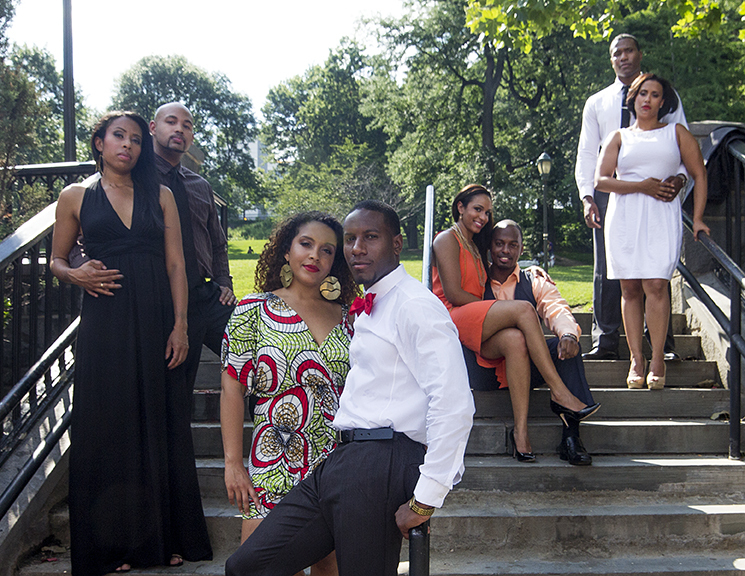 Tell us about the Colors of Love webseries and why it was created. The Colors of Love was created to visually see couples of colors but also tell a universal story that most couples can relate to. I also wanted to switch some of the gender roles to break some of the stigmas society places on people of color. So for instances, Mark and Valerie Pinkette one of the married couples. Mark wants to have a baby which I wanted to show because many times media portrays men of color as not wanting to have child and I made it where Valerie does not want to have child attempting to erase the idea that women of color love to pop out babies all the time. Tell us about Black Latina the Play. Black Latina the Play has been my most ran show and it really has been an amazing journey that continues to excite me. From sold out shows in NYC to Penn State University. We continue to develop and redevelop the show taking it to greater heights and pushing the envelop. My writing process is one of authenticity it has to be organic for me so it could be something as detailed as a relationship I have had or something my son says on the way to school that will spark something for me. We just finished our first ever summer series that was a compilation of 3 of our productions along with other productions. Now I am working on bring my show Black Latina the Play back to its original state as a one woman show to perform at the Smithsonian. I have produced, directed and written for the web and film. Media over all is my passion. I have been so very blessed to have many highlights in my career but as of right now the closest one that I can pick from is taking my show, the show that has started it all for my business to the Smithsonian. The shows started out as a one woman show in 2008 and in 2013 it was transformed into a 5 woman ensemble piece now by request it is back as a one woman show so I really feel like life has come first circle for me. What has molded your experience as an artist? The lack of roles for Black Latinas really is what molded my experience in theater and what made me start this movement. Being an actor and auditioning, not finding work that I felt was good enough for our women or roles I thought I could play but because I didn’t fit the look its really what started my journey as a writer. Our experience is extremely important. Just like any group wants representation we want our voice, experiences and stories to be told. What is one thing you wish you would have known before now? I wish I would have known that you cant have any expectation. Be willing to learn and moldable to grow and have longevity. How was the Summer Series? The summer series was incredible it was a huge accomplishment for us and we really went above in beyond for our productions and the other events we produced. We push ourselves out of our comfort zones to create an experience like we never had in 8 years. What is your advice to young Black, Latin@ and Afrolatin@ artists? My advice would be to be as truthful to yourself and your story as possible. The more real the piece is to you the more connected the audience will be to it, Don’t be afraid and never. Thank you so much for speaking with us about your time. We wish you the best on all of your projects.